Welcome to Introducing Willow, the top fan site supporting actress Willow Shields. Best known for her role as Primrose Everdeen in "The Hunger Games" series, Willow is already taking the entertainment world by storm. Here at Introducing Willow, you will find the latest news, photos, information, and more on Willow and her career. Thank you for visiting! Exciting news! The first trailer for Willow’s next film Woodstock or Bust is HERE! According to the trailer, the film is expected to be released in July 2019. Click the image below to watch the trailer and be sure to share the news! Happy New Year! Production from Willow’s next film Woodstock or Bust has released a few more stills and some new behind-the-scenes shots. Their website also says the trailer will be coming soon! Take a look. 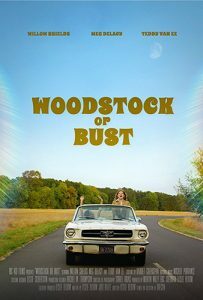 Willow’s next film, Woodstock or Bust, has just finished shooting. Lucky for us, production released the first official poster for the film as well as a few stills. I have added the new photos to the gallery as well as some behind-the-scenes ones. "After a fall nearly ends her career, an up-and-coming, single skater seizes an opportunity to continue as a pair skater with a talented bad-boy partner, she risks exposing a fiercely kept secret that could unravel her entire life." "Becca, a 16-year-old girl arrives at her new foster home located in a remote area. As she tries to adjust to her new home, strange things start to happen around her and Becca is uncertain about who or what is responsible. " "Two teen song-writers saddle up their West coast '65 Mustang convertible and head East, answering the call to Yasgur's farm, to debut their original music at the Woodstock Music Festival." Introducing Willow is an unofficial fansite created by fans, for fans. There is no monetary gain. We are not affiliated with Willow and her management. While we do have contact with Willow, we are not able to forward fan messages to her or give out personal contact information. All images, videos, and media are property of their respectful owners. No copyright infringement is ever intended. If you have any questions or concerns, please email us. Thank you.